Cryo Hops provide brewers with the ability to get gigantic hop character while reducing astringent and unpleasant vegetal flavors. With a substantially higher oil and resin content, LupuLN2 powder (pelletized) offers up all the flavor and aroma of a heavily hopped beer, but with a significanly reduced grassy character. Additionally, the lower dosage rate of the concentrated powder reduces the volume of trub and therefore, kettle loss. Using Cryo Hops you will net more beer that is clearer! Typical usage of Cryo hops would be roughly 50% of standard T-90 pellets. 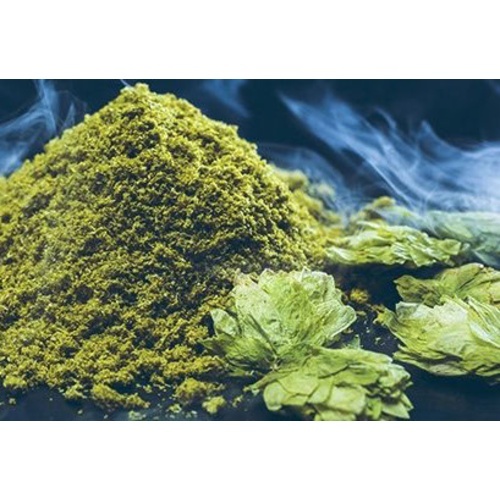 LupuLN2 powder can be used in any application where traditional hop products are utilized, including: Bittering, Kettle, Whirlpool and even direct to the fermentor. It is suggested that you use Cryo Hops as late additions, in the whirlpool or dry hop, as the volatile aromatic compounds will be driven off if added early in the boil. Great for very late and dry hop additions. Great Product! Buy it once, and you will be hooked. Never will use regular pellets again for the varieties available. I mean, why wouldn't you pick this? Awesome new form of a great hop. hop seem to stay fresher longer in this format, produces great flavor, less vegetal material to soak up beer, and drops out of suspension during cold crash. Great for dry hopping Hazy IPA. I use it in my dry hoping and it works well. It allows me to use It from fromImitation till the end.Three dry hopping's for an extensive period of time No worries of vegetable matter. These are great hops. Buy them now! Had a great first experience with this. Used for DDH IPA. I didn’t get any grassy flavors I’ve heard of others using regular pellets. I will definitely try to stick to cryohops for my dryhop additions. Great aroma when used in ss filter in the keg. Never got any grassy or off flavors. Made an 5 gal IPA using MO, a touch of Oatmeal, .5oz of Magnum for bitter, .5oz Mosaic Cryo pellets @ 10 and flameout and 1 oz Mosaic Cryo dry hop for 4 days. The pellets work great just tossed into the fermenter, they broke up and floated but some gentle rocking settled them down. I was shooting for an APA but these things pack a punch so I think anyone would guess it's an IPA. Great aroma and great flavor. Not sure what the guys who said they don't work for whirlpool did but there's no doubt a ton of hop character in my beer. Cant wait to try the same recipe with the other cryo options.